1. Cut mango and remove the seed. Cut into small pieces with skin and wash and pat dry it. 2. Mix chilli powder and 2 tablespoon salt and dry under sun at least 4 hours. 3. Roast all seeds separately and grind them. 4. Heat the pan with oil and add dry chilli. When dry chillies fries, add garlic, mustard paste, rest of spices and vinegar. 5. When it cooperates together, add mango pieces. 6. Stir well and cook about 5minutes. 7. Check the salt and remove from the stove. 8. Let it cool down. Then put into a jar and leave it again in the sun for another 4-5 days. 9. Enjoy mango pickle/ amer achar. Tips: The pickle need to dip into mustard oil. 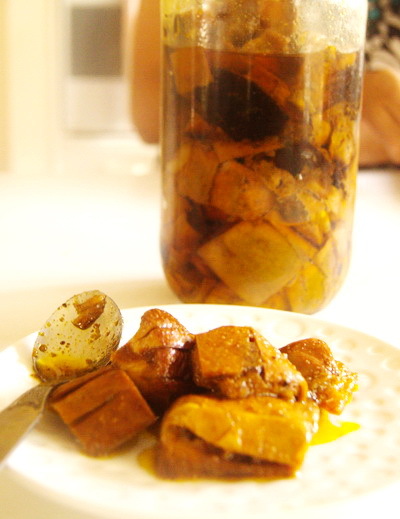 Hi,Rownak- can you please put the recipe of plum pickle(boroi achar) in your website. your website is always an inspiration to cook Bengali food. 🙁 I live in Australia so Boroi is not available here. As soon as I get Boroi here or I go BD, I promised that I will post it. So till then stay with me. Thanks. Sorry. it will be 1/2 cup vinegar..
What is nigella seed? What it’s bangla or English name, I never heard or used it. I love your recipes, I learned a lot from you. You are doing a very good service to lot of us who doesn’t know lot of different bangla cooking.love you. thanks a lot and nigella seeds means kalijeera. I would like to make a hot acher about 600 gm organic mango. Could you please confirm the measure of all of the acher ingrends. Such as 1tea spoon salt , hot chille ,measure of mastered oil? I am making first time of my life. Sorry for late reply. Hope already yummy achar. If you have not, please make sure that salt is always to taste, oil for pickle have to be enough to cover whole pickle (you can use less in cooking but you have to covering whole pickle when you are storing pickle in jar). And last not the least chilli , chilli to chilli varies heat level and everyone has different taste. So just use as much or as less chilli you want to add. Looking forward to hear from you and hope you forgive for late (I have good reason for my late reply).